Ivory Lodge - Hwange National Park Accommodation. Ivory Lodge is located outside the Hwange National Park on a private concession of 6,000 squared acres. This well appointed lodge is situated in the key home range of the Presidential Elephant herd, made famous by Alan Elliot in the 1980s. 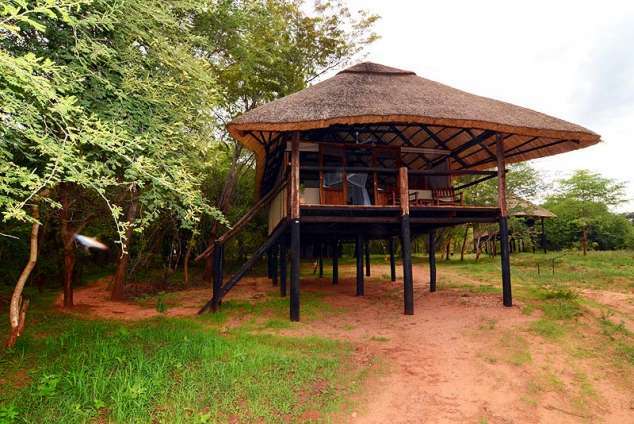 This safari lodge comprises of seven elevated thatched tree house style rooms, as well as two grand tented presidential suites, all commanding great views of a private and extremely active waterhole. Guests have the opportunity to view some of Hwange's most prolific wildlife species from the comfort of their room or the main dining area. The most commonly viewed species from camp range from big cat carnivores to plains game to herds of buffalo and elephant, sometimes up to 500 strong. At Ivory Lodge, the rooms are fitted with mosquito nets and each unit is fairly open, offering an intimate bush experience. Ivory Lodge takes children of all ages. Activities include; game drives, visits to the Painted Dog conservancy, village tours, walking safaris (on request) and game counts (also on request). 2812 page views since 11 Dec, 2013. Last updated on 26 Jul, 2017.